Though a powerful, fast and beneficiary gem stone when suitable but it requires genuine efforts on the part of its bearer too. Belonging to the planet Saturn which is associated with Shani God who is known to judge everyone on the basis of karma, a person needs to be positive, genuine and a hard worker to impress the almighty. Hence, the tip for all the Neelam owners is that just wearing the stone will not magically work for you, for being blessed with wonderful results by Shani God you should do hard work too! 2. Myths call Neelam a malefic gem stone! According to a popular myth, people consider Neelam to be a malefic gem stone which will completely destroy an individual and thus they fear the stone. However, just like any other gem stone, Neelam contains healing properties which can change your life for the better when worn after proper consultation. When suitable, Neelam will not only reduce the effects of ill placed Saturn but will also bless you with financial gain, better health, promotion, positivity, etc. One is advised to continue doing efforts, be positive and possess patience to reap sweet fruits of wearing the precious gem stone. 3. Recognise the warning signs! After wearing Neelam stone, be very alert for any kind of negative changes including additional diseases especially eye related problems, financial loss, health going downhill or arrival of new problems and so on. These are the warning signs that the gem stone gives you when it does not suit you. Removing the stone and not wearing it again is best for you at that moment! 4. Take well care of this auspicious stone! Though a gem stone with high durability, like other things it also requires cleaning, purification and care. 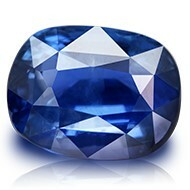 For cleaning a Blue Sapphire stone, one should use a soft bristle brush with detergent and mildly warm water. As far as its purification is concerned, it needs to be soaked in gangajal or milk at an auspicious time and day which you can ask from your astrologer. Reciting Shani Grah mantra is considered as the best way to energise the gem stone, but again you need to consult an astrologer first. Any ritual concerning Neelam stone must be proceeded with great caution. The stone requires premium care for blessing you with prime benefits. This auspicious gem stone is an extremely precious and rare one. Though found mostly throughout the world, but the most authentic and legit ones are found in the mines of only a few places such as India, Australia, Sri Lanka, Madagascar, Brazil, Burma and Thailand. While buying Neelam stone, the person should be careful to avoid a fake stone or the one with any kind of a flaw. The easiest way to test the reality of a Neelam stone is by holding it in your palm, if it spreads warmth then it is a real gem stone otherwise not! We hope that knowing these astonishing Neelam facts would prove to be interesting and beneficial for you!